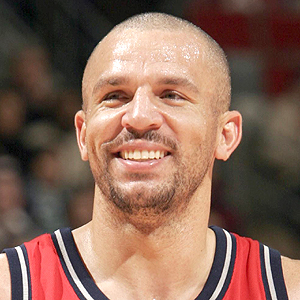 So it looks like a different deal is now in the works between the Dallas Mavericks and New Jersey Nets for Jason Kidd. With the announcement of the first deal and its subsequent fall-out, you knew it was just a matter of time before this deal would get done (trade deadline is this Thursday, by the way). I always love it when they pay guys who are retired just so salaries match up. It really is a ridiculous notion. So Van Horn, who has been retired for a year and a half, will now either get a shot with the Nets (who actually drafted him) or will be paid to do nothing. How do I get that gig? Seems like a better deal for the Mavs now that they can keep Stackhouse (although he was coming back in 30 days anyways) and basically lose Hassell. I still cannot believe they are giving up Harris for a 35-year-old guard, but Mark Cuban has been itching for a title ever since it was stolen from him by Dwayne Wade. The fantasy implications are still the same since the major pieces did not change. You can read about them here. As always, breaking trade analysis can be found here at FBP. Sign up for our RSS feed to receive updates in your favorite reader. 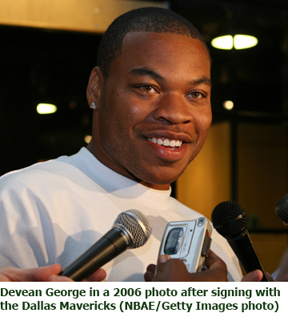 Devean George Blocks Kidd Deal With No-Trade Clause!?! According to ESPN, Devean George will exercise his rare no-trade clause to block a proposed blockbuster trade that would have sent Jason Kidd to the Dallas Mavericks. We chronicled the trade and its fantasy impact on FBP earlier today , but apparently it is NOT going to go through. So it looks like this deal isn’t happening just yet. My belief is that some sort of deal gets done in the end, with or without George (talk about an important piece of puzzle <–sarcasm). Why the heck does George have a no-trade clause anyway? I mean sure he’s a veteran now and I know he “won” (more like sat around and was gifted) 3 championships while with the Lakers, but this is absurd. I’d be interested to hear from our readers in the comments what they thing will happen with this situation–will Kidd eventually find his way to Dallas?–if so, for who? Also, for more NBA breaking news subscribe to FBP’s RSS feed. 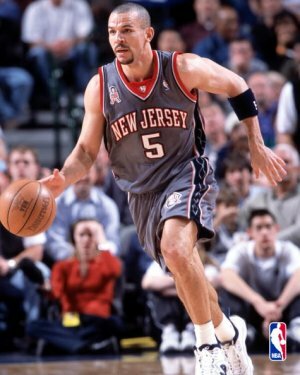 The Dallas Mavericks have apparently countered the trades for Pau Gasol and Shaquille O’Neal by acquiring future Hall of Famer Jason Kidd and Malik Allen from the New Jersey Nets for budding young guard Devin Harris, Jerry Stackhouse, Devean George, DeSagana Diop, Maurice Ager, two first-round picks, and $3 million. It was an extremely steep price to pay for Kidd, especially considering what the Lakers paid for Gasol (doesn’t look like Gregg Popovich will rip into this trade like he did with Pau’s). The fantasy impact for the remaining Mavericks is all positive. Not only do they add one of the greatest pure point guards to play the game, Dallas has also gutted almost all of its depth, and Dirk Nowitzki, Josh Howard, and Jason Terry will all see increased minutes and productivity. Erick Dampier becomes a definite pick-up with the dismissal of Diop, and Brandon Bass all of the sudden becomes one of the first guys off the bench. Expect this unit to mesh quickly and perform well. seems to have little need for him (although they still technically are right in the middle of a playoff race). Harris should return after the All-Star Break and will take the minutes that were supposed to go to Marcus Williams (so do not pick up Williams). Harris becomes one of the better options for the Nets, and Richard Jefferson and Vince Carter will take a few more looks, although losing a point guard like Kidd will hurt a lot. Diop gains minimal fantasy value, while the others in the deal have no fantasy impact. Thus, it seems like another win today sacrifice tomorrow deal that may work out for Dallas. Fantasy-wise, it seems that the entire Dallas rotation will benefit, while Harris may gain more minutes and production while Carter and Jefferson, both adept at creating their own shot, will see very little change. Did Dallas “purge their roster with a high cost?” ArmchairGM thinks so. FanIQ still thinks the Suns and Lakers are better than the Mavs. National Lampoon Splog! shows us an interesting picture of Kidd. For more NBA breaking news and it’s fantasy impact, subscribe to FBP’s RSS feed.